The United States signed an accord yesterday that will allow for a U.S. ‘interests section’ in the Swiss embassy in Caracas, the same arrangement it has had at the Swiss embassy in Tehran for the past 40 years. But the Canadians remain entrenched in their five-story embassy on the corner of Altamira Square, with no plans to go anywhere. “I’m glad that Canada didn’t do the same thing as the U.S. because you need people on the ground in places like Venezuela to get a sense of what the citizens are saying on the ground,” said Ben Rowswell, the last person to serve as a full ambassador for Canada in Caracas. “There’s a reason that the U.S. sometimes acts in foreign policy like it’s blind and deaf, and that’s because it actually ends up removing its eyes and ears from the places that matter the most, like Caracas. Canadian officials and their Venezuelan counterparts — both the ones who support current President Nicolás Maduro and those backing opposition leader Juan Guaido — have described a strange diplomatic equilibrium that allows Canada’s embassy to remain in Caracas despite government orders to leave, and also lets Maduro’s government retain five diplomatic properties in Canada, despite the fact that Ottawa doesn’t recognize it. “I have an accreditation issued by the Government of Canada as a diplomat in this country,” Prof. Luis Acuna Cedeno told CBC News. The former graduate of the University of Western Ontario served as both a cabinet minister under President Hugo Chavez and as governor of Sucre state under Nicolas Maduro. Today, he retains control of Venezuela’s embassy in Sandy Hill, Ottawa, with the title of ‘charge d’affaires’. Meanwhile, the man Canada does recognize as Venezuela’s legitimate representative is unable to set foot in his country’s embassy or official residence. He’s also barred from becoming a diplomat in Canada because of his immigration status as a Canadian permanent resident. Viera Blanco said he’s also unable to visit the nation he represents because he faces a criminal charge of treason for accepting the post of representative for the man Canada has recognized as Venezuela’s acting president, Juan Guaidó. The unusual modus vivendi the parties described to CBC News appears to have endured because — for the moment — it works for all three parties. Canada’s toleration of the presence of two rival representatives from Venezuela is a pragmatic quid pro quo for Venezuela’s tolerance of the Canadian diplomatic presence in Caracas. The situation stands in sharp contrast to that of some of the other key players in the fight over Venezuela’s future who have been unable to maintain a diplomatic presence in Venezuela. For six weeks now, the border has been closed between two countries that were, for the first twelve years of their independence, a single nation. Colombia and Venezuela have since engaged in a war of words that occasionally has spilled over into border clashes, pitting the Colombian military against shadowy paramilitary groups that Bogota considers to be protegés of the Maduro government. Colombia also has lost the ability to help its citizens in Venezuela, where they are by far the largest group of foreign residents. Just hours after a State Department briefing on Venezuela that made no mention of closing the U.S. embassy, Secretary of State Mike Pompeo surprised many with a late-night tweet from Texas in which he announced that Washington was pulling out the last of its diplomats. The U.S. will withdraw all remaining personnel from <a href=”https://twitter.com/usembassyve?ref_src=twsrc%5Etfw”>@usembassyve</a> this week. This decision reflects the deteriorating situation in <a href=”https://twitter.com/hashtag/Venezuela?src=hash&amp;ref_src=twsrc%5Etfw”>#Venezuela</a> as well as the conclusion that the presence of U.S. diplomatic staff at the embassy has become a constraint on U.S. policy. Non-essential staff and family members had departed two months previously. On January 24, Maduro gave the U.S. embassy 72 hours to either withdraw its recognition of Guaido or withdraw its diplomats. When it became clear that the U.S. did not intend to comply, Maduro issued a face-saving 30-day extension, which he renewed for another 30 days in February, ostensibly to allow for negotiations on setting up a U.S. interests section in another country’s embassy. But those talks (if they happened) went nowhere, and the U.S. pulled the plug on the embassy just before midnight on March 11. The U.S., like Canada, has urged its citizens to leave Venezuela and has given the country its highest-level travel warning. Canada’s embassy has stayed open despite logistical difficulties — including prolonged city-wide blackouts caused by the collapse of Venezuela’s electricity network — by running diesel generators and stockpiling water. 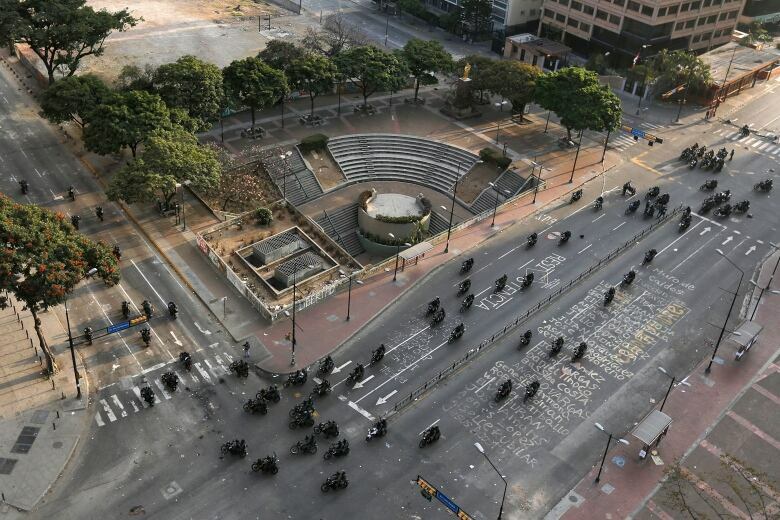 Its location on Plaza Altamira has put it at the heart of numerous protests, some of which have ended in gunfire, injuries and deaths. “The protesters themselves were never a problem,” said Rowswell. “But when the police forces would enter the square to try to clear it, that would create a situation of tension in the plaza. When Rowswell finished his term as ambassador, the Venezuelan government refused to allow him to be replaced, as it had been angered by Magnitsky Act sanctions brought against certain members of the Maduro regime. A more junior diplomat, Craig Kowalik, took over as charge d’affairs. He lasted for about six months before he learned from social media that he had just been declared persona non grata — along with the fully-accredited ambassador from Brazil. As 2017 turned into 2018, Kowalik found himself briefly camping out at his parents’ house in Canada before taking on a new assignment in Colombia, where much of his work these days involves Venezuelan exiles and migrants. Diplomats in Caracas have grown used to a steady stream of denunciations, including trips to the Venezuelan foreign ministry to receive protest notes. As well as surviving downgrades and expulsions, the Canadian embassy managed to ride out one ultimatum to close up shop by simply ignoring it. On January 9, the Venezuelan government gave Canada 72 hours to retract a statement saying that Maduro, whose presidential term had ended that day, was no longer a legitimate president. If Canada did not retract, Venezuela would break off relations. On the Saturday the deadline was to expire, Venezuela’s foreign ministry announced that President Maduro had decided to extend the deadline for Canada (and fellow miscreant Paraguay) to the following Monday. Again, Canada did nothing. It’s position on Monday was the same as on Friday, and remains the same today. The Parauguayan embassy is closed and its diplomats are gone. Canada’s are still there. “(Members of the Maduro regime) are aware of how isolated they are,” said Rowswell, “and they sometimes lash out in anger in ways that aren’t entirely thought through. And they’re sometimes performing for the cameras, and not engaged in real conversations. Often you’ll see them making a threat on television without ever having communicated with the embassy. “My experience was you never knew who they were going to pick on. You’d wake up one day and it would be the Italians, the next day it would be the Spanish, almost every day (it) would be the United States, and then regularly every single Latin American country would be singled out for abuse. On March 4, Guaido returned to Caracas after a tour of South American capitals, during which he was fêted by the presidents of Argentina, Brazil, Chile and Colombia as the legitimate president of Venezuela. Fearing that he would be arrested, diplomats from several countries, including Canada, went to the airport to greet him. Venezuela responded by giving German Ambassador Daniel Kriener 48 hours to leave the country, which he did. Again, the Canadians escaped a sanction. Rowswell said he hopes this unusual situation can be maintained, even though it rests on shaky diplomatic ground.